Gain the benefits of PTFE gasketing without the problems of creep and cold flow. Unmatched in sealing reliability, GORE® GR Sheet Gasketing provides high-temperature and blowout resistance superior than any other PTFE sheet gasket. Dimensionally stable, yet conformable, GORE® GR sheet is ideal for real world flange conditions. It conforms to rough surfaces, yet compresses into a very tough gasket that makes a tight, long lasting seal. 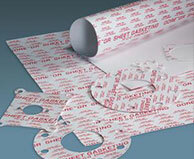 GORE® GR sheet gasketing is ideal for sealing steel flanges for many aggressive chemicals. For industrial use only. Not for use in food, drug, cosmetic, or medical device manufacturing, processing, or packing operations.